Elbow joint - Artifical Joint 《TEIJIN_NAKASHIMA》 - Surgical Equipments&Implants - Product - The Industrial Promoting Co. Ltd.
Elbow joint prostheses are mainly comprised of humeral and ulnar components. They are reconstructed by sliding the articular surfaces of these two components. 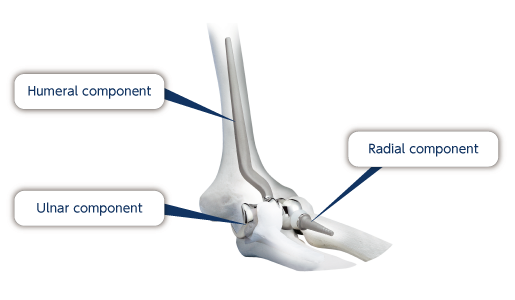 Depending on the product, we can offer a radial component that enables the elbow to bend and stretch naturally. There are two ways of anchoring joint prosthesis, with bone cement or without bone cement. Teijin Nakashima Medical’s products that are attached without bone cement are processed with a titanium mesh on the bone contact surface of the humeral and ulnar components. With this process, the components adhere by the natural growth of bone tissue into the porous surface, making for a longer lasting prosthesis.